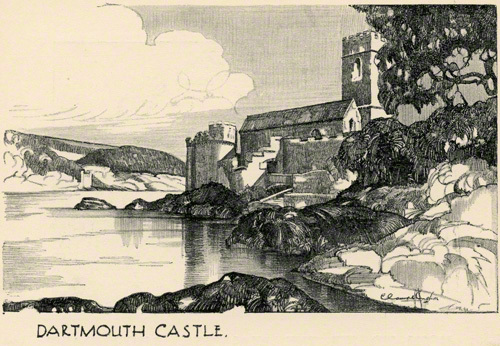 Claude Buckle shows Dartmouth Castle from the shoreline. This pencil sketch was used as a menu card. Dartmouth Castle is one of a pair of forts, the other being Kingswear Castle, that guard the mouth of the Dart Estuary in Devon, England. A small Fortalice (coastal fort) was built in 1388 under the direction of John Hawley (rumoured to be the basis for the Shipman in Chaucer's Canterbury Tales). Created in 1934.